No, I am not referring to my own mental state. I’m talking about the novel I’m reading in my Resource Room. 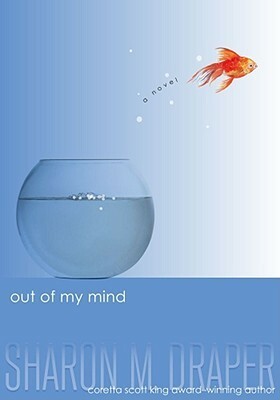 Out of My Mind by Sharon Draper was suggested to me by Follower 100. She must have known that this would be a perfect book for me. And now, I’m going to share it with my class. The 2013 Global Read Aloud, Out of My Mind, was one of the best books I’ve read in a long time. In fact, as I was telling my dad about the book, I kept referring to the main character as if she were a real person. I think, as an intervention specialist who has worked with students with a wide range of disabilities, this book just touched my heart. I don’t want to write a book review as there are thousands you can read for yourself. I did locate some good resources on Teachers Pay Teachers, if you decide to use this book in your classroom. Once I get my unit plans completed, I’ll share them here. This book was suggested to me last year but one of my “reluctant readers”. She loved it, shared it with a couple of other, stronger readers and they asked me to read it aloud. It was wonderful; so many incredible conversation, so much thought, so much maturity. We are Reading Buddies with a classroom of multiply handicapped kids and my students gained incredible insight from the book. Have you read “Wonder”? Another great read. We are only two days in, but so far they seem to like it. I am excited because I am doing a mash-up of several ideas and it’s just falling into place. I haven’t heard of Wonder. Who is the author? Have fun with Out of My Mind!